Watermakers for boats are now compact, efficient and so reliable that everyone considering an extended trip should plan to install one. Every boat should consider a water marker, given how compact and efficient they are nowadays. The fuel saved by not carrying the extra weight of water could easily recoup the initial investment, and there is the benefit of not being tied to the capacity of your tanks. But the range of options is extensive, so here’s the low-down. Although they’re commonly called marine watermakers, the more correct term is a marine desalinator. These units remove the salt from seawater and produce drinkable water. Most cruising boats built after 2000 will have a water maker installed, and thanks to reducing costs and size, retrofitting a boat desalinator one on a coastal boat has become a viable option. Although a boat desalinator does not replace a freshwater tank, a watermaker does allow for a marked reduction in the size of a boat’s primary water tank and all going well, a luxury many people will enjoy — endless showers. A boat desalinator operates in two distinctly different ways: The first process, known as distillation, involves heating the water until it evaporates (leaving the salt behind), then capturing and condensing the steam back into water. These units are mostly used for large commercial desalination plants and are seldom (if ever) found on a boat. 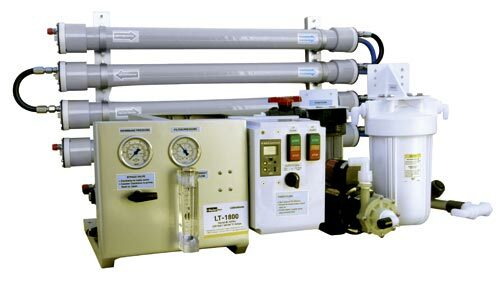 Any marine watermaker unit you may consider will work via another process known as reverse osmosis. Based on a patented invention by DuPont in 1969, reverse osmosis forces the raw product (seawater) through a microscopic filter called a semi-permeable membrane to remove the undesirables (salt). The size of the screen in these filters is around half a nanometre across, or five billionths of a centimetre. This special material used in the boat water maker, usually wrapped in a spiral pattern in a long tube, allows the small water molecules to pass through. Salt molecules are around 0.7 nanometre and are therefore blocked by the filter membrane. In the process the filter also removes most other pollutants, including heavy metals and virtually every known chemical compound. When properly installed and cared for the filters will last a long time since the particles don’t clog the membrane and just washed away when waste water is back-flushed through the system. The only problem with this technology, as most high school chemistry students will know, is that a normal osmosis process flows in the opposite direction. Water molecules naturally travel across a membrane from the purer water side to the saltier side to try and achieve balance. In other words, left to its own devices nature prefers to exist in equilibrium and tries to achieve that. In reality the osmosis can only loosely be applied to desalination as in reality high pressure needs to be applied mechanically to the salty side to force the water molecules to travel the opposite way. Around 300psi (ten times the pressure of a car tyre) may be applied to get the reverse osmosis process under way. Watermakers range in size from small, hand-pumped emergency modules, through to large, powered units capable of producing thousands of litres per hour. Most ship’s lifeboats will contain one of the hand-pumped units, which can operate almost indefinitely as long as someone is there to pump it. But the high pressure required makes it a slow process. Most permanent installations are electrically-powered either by an AC or a DC current although mechanically driven units are often cheaper and more reliable. Watermakers are generally hassle-free if properly cared for but if not they can be troublesome little beasts. The seawater strainer and particle filters need to be cleaned regularly, since they pre-filter the water before it reaches the microscopic membrane. It is obvious that the cleaner the water going in the better the system will perform. If the unit is being used frequently the only maintenance that the osmotic membrane requires is regular flushing. This removes the high concentration of salt from the salty side of the system. Many units have an automatic flushing system, while smaller units may require manual flushing. But a bit more care is needed if the unit is not used for a week or more. Since the osmotic membrane should always be kept wet it can also be fouled by waterborne bacteria. This means if you are not using your boat for some time then you need to store the membrane in a special solution, a process referred to as "pickling". The bacterial problem can also be mitigated somewhat by installing a UV steriliser inline, although this does add to the overall energy consumption. One last consideration is that the membrane will be damaged if the water in the system either freezes or gets above 60oC. Neither are typical boating conditions in Australia, although a cruising boat down south may encounter below-zero temperatures. 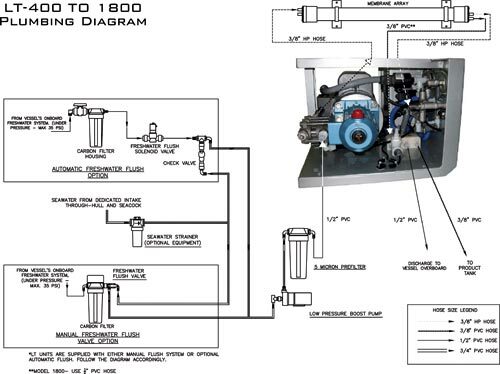 There are a number of reputable manufacturers of watermakers suitable for marine installations. The first decision is which power system to use. Although power consumptions vary depending on model, electrical units seem to use somewhere between 10 and 20 watts per litre. 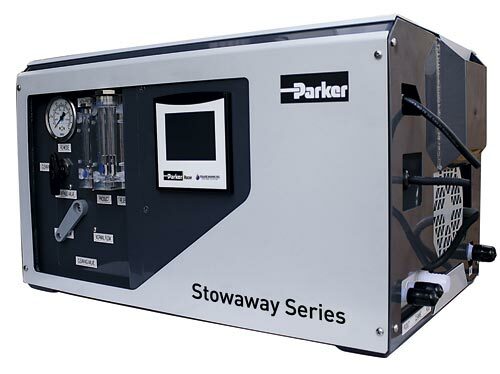 So a 250lt/h marine watermaker unit may draw around 10amp at 220V; a smaller 12V unit is likely to produce somewhere around 30lt/h and draw in the order of 20amp. A unit driven off the main engine can produce large amounts of freshwater, but does require sufficient space around the engine for the high-pressure pump and take-off belt. For powered vessels this is possibly the most sensible option, as the engine will run regularly. The energy absorbed by the water pump is relatively low compared to a typical diesel’s output, and hence it would have very little discernible effect on performance. But it does mean that the main engine would need to run to make water, and hence an auxiliary engine could be used to drive the pump instead. Larger boats could possibly have a standalone watermaker powered by its own auxiliary engine. Next down the line in terms of capacity are AC units, which require an inverter or generator to run. These typically come in capacities of between 80 and 250lt/h. At the lowest end of the scale are the DC-powered units, with outputs typically around 50lt/h. There are energy-efficient units that often claim to use 40 per cent less energy than their bigger cousins. The smallest automatic units are 12V or 24V and range from 30 to around 80lt/h. Because of the relatively low power consumption these models are popular with cruising yachts when combined with a solar panel, and can essentially be set-up to run automatically whenever the sun shines. This is an ideal solution in the tropics, since the sun shines more and the reverse osmosis process is more efficient when the system is warmer. Even with the best-laid plans things go wrong and a lack of water might well be fatal before your next landfall. It would be wise for any passagemaking or long-range fishing boat to still install a large primary water tank and to keep it topped up. As an added safety measure always carry a manual watermaker. Equipment failure will never be life-threatening if you are at least able to make enough freshwater to drink. Handheld units are now available for under $2000, although as with everything the better units cost more. (Editor’s note: On my long-range vessels I always carry enough fresh drinking water in stored containers to complete a trip. An absolute minimum of two litres per day per person is a good place to start. Consider doubling that in warmer climates). While perusing the offers on display at this year's Sanctuary Cove show I was pleased to find an all-Australian-made watermaker brand and just had to slot it into this story even though the copy was produced a while ago. General Manager of Stella Watermakers, Kyle Matthews, gave me the low-downon the two types of watermakers the company manufactures. The first option for most buyers, the Electric 240V-AC is easy to install and makes plenty of water fast. You will need a minimum 3kVa (continuously rated) genset to run the 240V-AC electric unit. Water output is set at 70, 140 or 210lt/h using 1, 2 or 3 standard membranes. The total power usage (including the boost pump and high-pressure pump) is approximately 12amp when running. An excellent option for those without a generator, this system is a very efficient and reliable and also produces good volumes of water quickly. You will need a suitable engine with room to fit an engine bracket and pulley system. While some standard brackets are available custom fabrication is occasionally required. Output volumes can be 70, 140 or 210lt/h of water using 1, 2 or 3 standard membranes. The total power take-off is around 2hp. All Stella watermakers are modular (that means they come as separate components rather than a complete unit in a large framed box) so they can be fitted wherever there is available space. 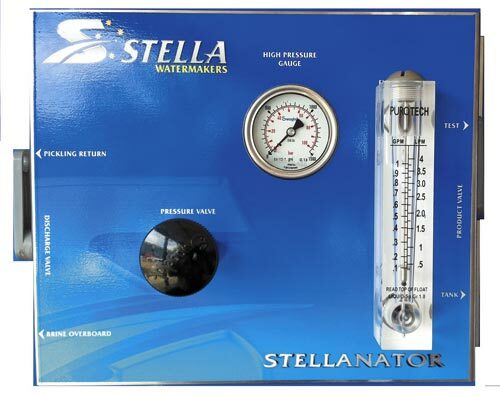 Stella watermakers also use no electronics, just simple control valves for reliability. Costs are minimal, but will depend on how often it’s used and maintained. * The two sediment filters cost $10 each and are washable so they usually last weeks or months. * The carbon filter expires every six months at a cost of around $20. * The pickling solution lasts a year or two and costs approximately $20. * The primary membrane is around $400 and lasts five to seven years if not damaged. * Oil to service the high-pressure pump costs $20 every six to 12 months. All watermaker membranes need to be freshwater flushed for one to three minutes, only using freshwater from the tank every seven days, when not being regularly utilised. This can be done manually via the flushing valve each week or by fitting an optional Auto Flush system, which automatically flushes for a few minutes at the required interval. If a longer period of inactivity is anticipated the membrane can be pickled for long-term storage. 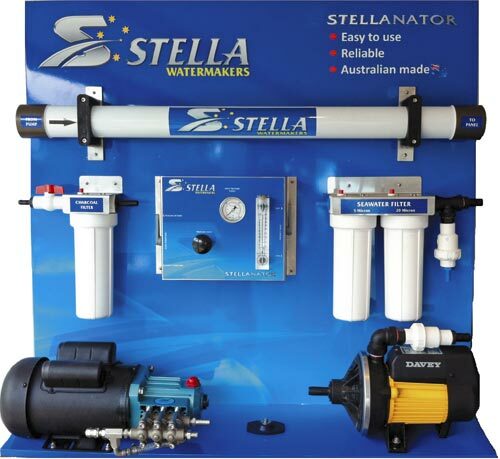 Stella Watermakers (above and below) are Australian-made, and modular in design for easy installation. The Stowaway is a fully self-contained 240V-AC unit, regarded as the Rolls-Royce of desalinators, with touchscreen controls. 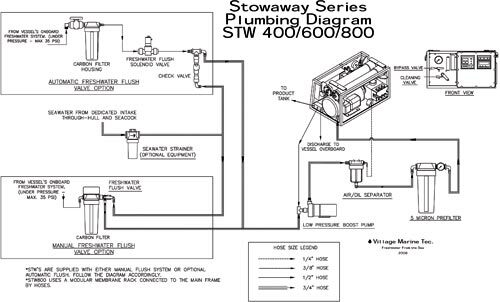 Plumbing diagram (below) showing the utilisation of an engine-driven pressure pump — a system ideal for those with limited AC power available. The LT-1800 (above) is AC-powered and rated to 6800lt per day. These can be fitted in several configurations as long as the plumbing is strictly adhered to. From Trade-a-Boat Issue 428, June-July 2012. Story by Norman Holtzhausen. Photos by Riviera; supplied.